In this solo cooking adventure, Gary recalls and recreates a tradition that began in college. Top left – green beans and corn. 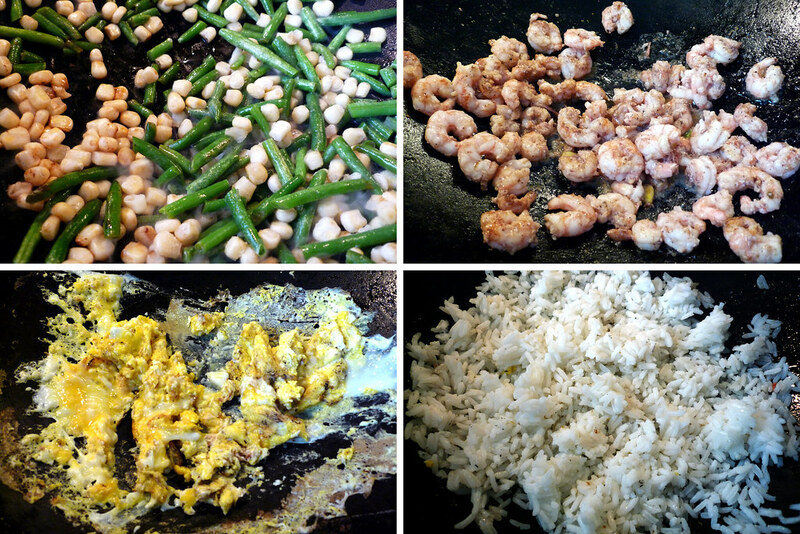 Top right – shrimp. Bottom left – eggs. Bottom right – leftover rice. One of my favorite memories from my years away from home to attend college comes from my senior year. Unable to come home for Chinese New Year, my roommate Justin P (henceforth referred to as JP) thought we should do a dinner to celebrate in our apartment. As a reference, we had a 1970s-era Chinese cookbook his mother gave him. After a lengthy amount of laughter over the ridiculously cheesy presentation (it’s the epitome/caricature of what mainstream America thought of Chinese food and culture), we got to the heart of the matter and found some recipes that would get the job done. The end result was a great meal though perhaps not entirely an authentic one. We even took the DIY route to turn out a dish which I’ll elaborate on in a bit. Skipping ahead to the past weekend, I had plans to visit JP in his much larger home (larger than mine anyway) and his much larger, better equipped kitchen. In advance of this trip, I asked him if he wanted to maybe do another Chinese New Year meal during this visit. JP, as always, was game and we quickly started sketching out some general thoughts as to what to serve. Char siu (Chinese roasted pork) was a no-brainer seeing as how that was easily the most fun we had the first go-around in college. As the weekend drew nearer, he got ahold of some great shrimp that would go well in fried rice so that was added to the menu. For a meal, fried rice and char siu would be nice; for a Chinese New Year meal, we’d need something more, but what? The answer came while we wandered through an Asian supermarket in search of ingredients we’d need for our meal. And it was a simple solution. Pork belly! How did it take us so long to think of siu youk (Chinese crispy pork belly)? It’s everything you want – meaty, fatty, and crispy. What better way to celebrate prosperity in the coming year? With the menu complete, it was time to prep the meats, something we did a day in advance of the meal to give them the proper time to marinate. Top left – char siu sauce before reduction. 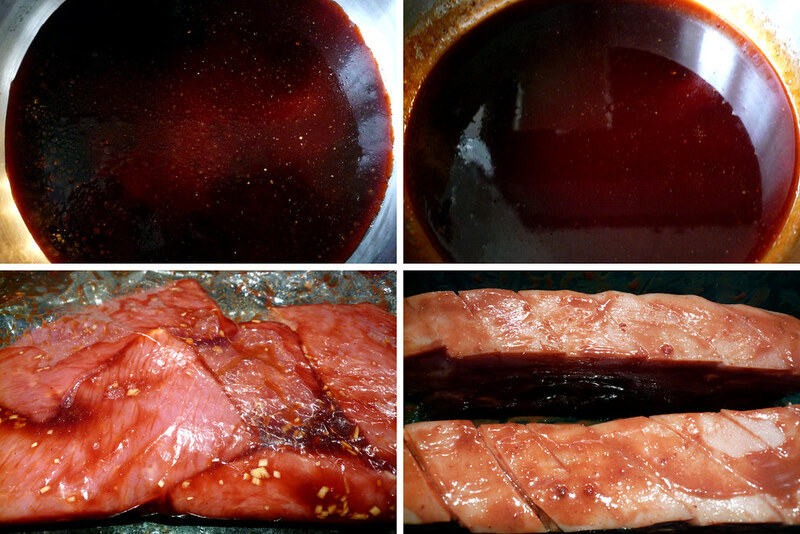 Top right – char siu sauce after reduction (note the shininess). 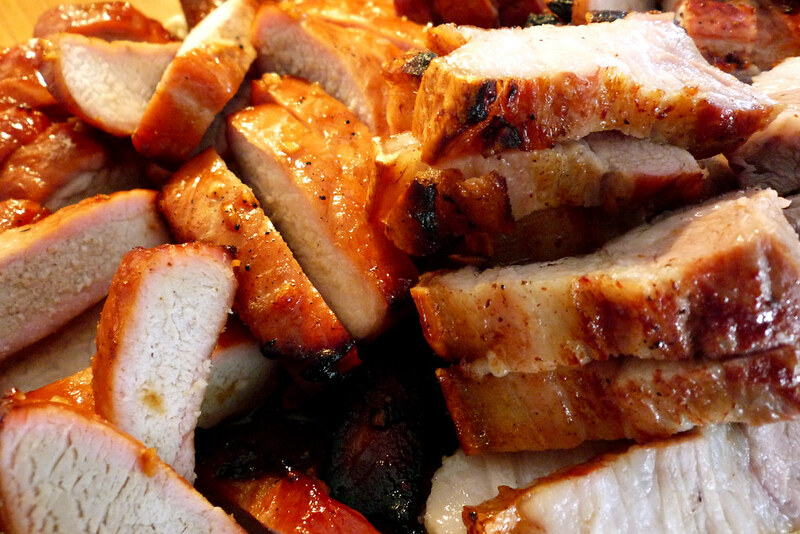 Bottom left – pork loin marinating in char siu sauce. Bottom right – pork belly marinating in nam yue sauce. The next day, we got to work cooking the suckers you see above. The siu youk was pretty straightforward – just sit the pork belly on an oven rack and let it cook normally, then broil at the end to crisp up the skin. The char siu, however, is where we got creative. When my parents would make char siu at home, they would lay the pork on racks in the oven but that would leave grill marks on the pork. That’s something you don’t see in the char siu at Chinese restaurants since they hang their meats on hooks. Well, in college, we didn’t have hooks but we did have paper clips. That was our DIY contribution to Chinese cooking – bending paper clips into hooks so we could hang pork in the oven. My forefathers would be so proud. 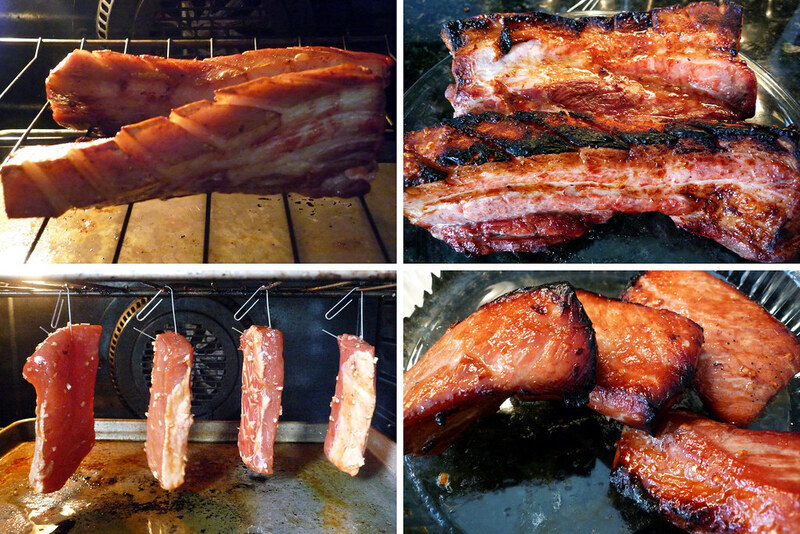 Top left – pork belly cooks on the rack. Top right – finished siu youk. Bottom left – pork loin hanging on paper clip hooks. Bottom right – finished char siu. With the pork cooking in the oven, we turned our attention to making the fried rice since no Chinese meal would be complete without some sort of rice dish. 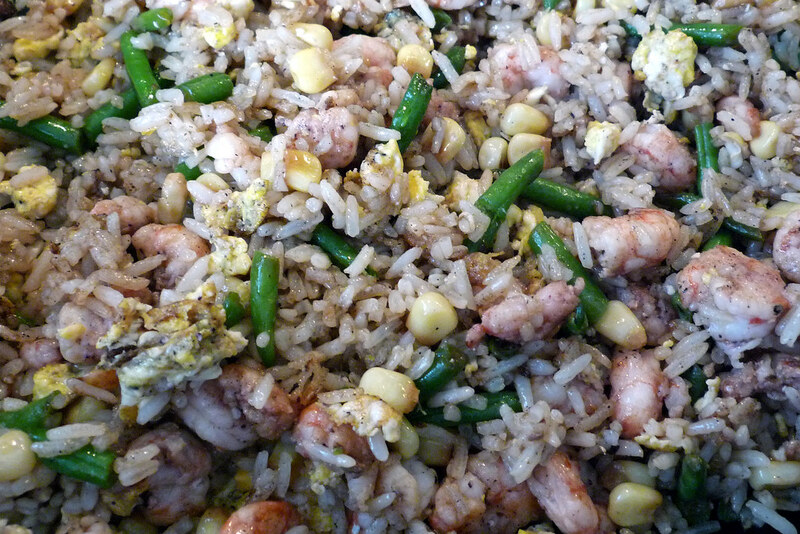 Fried rice is sort of a freeing experience as there’s really no recipe. You just take some leftover rice, some protein, and whatever vegetables you’ve got lying around. Cook each component separately, combine, add some flavoring, and you’ve got fried rice. The only way you can mess it up is to use fresh rice because you will be trying to move one giant wet mess of rice. Not fun. While JP made the fried rice, I sliced up the char siu and siu youk. The char siu didn’t come out as, well, charred as I would have liked it but any longer in the oven and it would have been overcooked. As it stood, it was already closer to well-done than preferred. The siu youk, however… man, there’s no greater sound than the crunch you hear when the knife plunges into the crispy pork skin. It came out perfectly – the skin crisped all the way through, the fat layer was of manageable thickness, and the meat underneath was moist. With that task done, all that was left to make our own plates and then it was time to feast. Char siu and siu youk. Gung hay fat choy! That’s “happy new year” in Cantonese. Combine all the ingredients for the char siu sauce, minus the cooking oil, in a saucepan. Heat it up until it thickens up and becomes sticky, yielding approximately ½ cup of sauce. Let it cool. Marinate the pork pieces with ⅔ of the char siu sauce and the chopped garlic overnight. Add the 1-½ tablespoons of canola/vegetable oil into the remaining char siu sauce. Refrigerate the sauce. The next day, shake the excess sauce off the pork pieces and carefully thread a paper clip through one of the shorter ends, about an inch from the edge. Be sure to leave enough room for the paper clip to hook onto an oven rack. I prefer to use the larger paper clips since they’re longer and tend to be stronger. Also, make sure to use plain paper clips as the paint on the colored ones may flake off. Roast the char siu for 15 minutes in an oven preheated to 375 degrees F.
After 15 minutes, glaze the char siu with the sauce. Cook for an additional 10-15 minutes. The pork should just begin to show signs of charring on the edges when it’s ready. Slice the char siu and drizzle with any remaining sauce. Serve immediately. Combine all the marinade ingredients in a small bowl. The fermented bean curd should be thoroughly smashed until well combined with rest of the ingredients. Score the skin of the pork belly. This will ensure the fat has somewhere to go while roasting, allowing the skin to crisp and prevent too much curling from occurring. Rub the marinade into the pork flesh. Pat the skin dry, then rub the kosher salt onto it. Refrigerate and marinate overnight. Let the pork belly sit at room temperature for an hour before cooking. Take this time to preheat the oven to 375 degrees F.
Place the pork belly on a rack in the middle of the oven and roast for 20 minutes. Then, brush the skin with the white vinegar (it promotes crackling) and switch the oven to the broil function. Watch the pork belly carefully, as the skin is going to rapidly go from a pale pinkish color to light orange to dark orange, and if you’re too slow, to black. Remove when the skin starts to char heavily around the edges. This can take around 10-20 minutes after setting the oven to the broil function. Let it rest for a few minutes as the siu youk will be very hot when removed from the oven. Then, chop it into pieces, doing your best to keep the skin from separating off the meat as you do so. Serve immediately. @katherine Paper clips are great multi-taskers so they’re Alton Brown approved! @Mike Thanks! My college buddy and I really love pork. I was able to partake, and it tasted as good as it looked. @dave This meal would be perfect for you and I if we had some Buble to go with our Hamm. Oh wow! This looks like my new favorite way to eat pork!!! @Melissa Anything that involves crisping skin is my favorite way of eating meat! Man, my grandmomma was from Sicily and she made the most incredible meatballs I ever tasted, like you wouldnt believe. Sadly, she died last year and she didnt leave a single recipe for us so I’ve been trying to work it out on my own… slowly working my through the meatball recipes here, I still cant figure out what her secret ingredient was though!! !